If your make up storage needs an overhaul but you're fed up of seeing photos of acrylic boxes, stark Ikea countertops and plain-jane brush holders, then I have just the thing to get your storage inspiration juices flowing. My taste has been quite girly of late, half 'shabby chic', half 'polished and shiny', but definitely feminine, and for some reason I'm very taken with white metal homeware accessories at the moment. I was having a browse through eBay and found some items that really stood out to me and I could definitely see on my own dressing table. Whether you love or loathe my picks, they're guaranteed to get you thinking about your own storage, and wondering whether your knick knacks are really just knackered. The items above are all ideas for storing palettes in a way that keeps them organised, but easily on hand. The top four are a combination of toast racks (I'm guilty of keeping my palettes in a rack that actually says 'toast' on it), and letter racks, while the lower wooden four are more shabby chic items predominantly designed for mail. [Items named from left to right, prices excluding postage]. 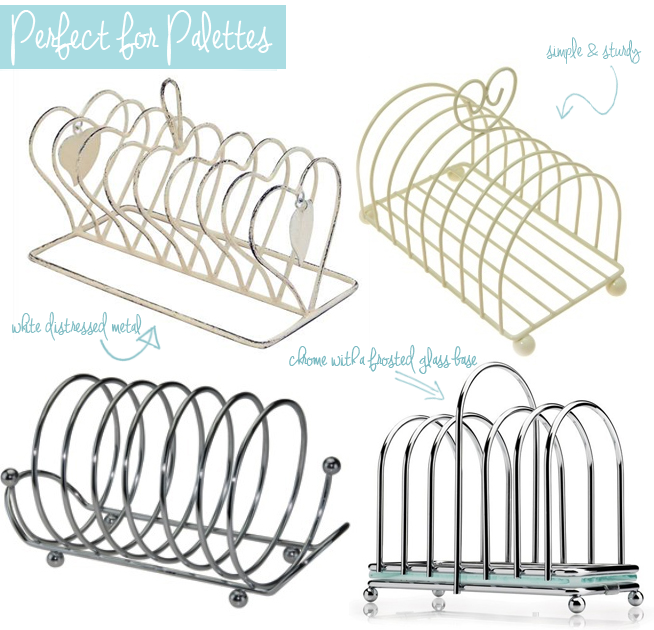 The Cream Hearts Rack (£8.99) is definitely the most feminine despite it's distressed look, while the Shabby Chic Cream Wire Rack (£4.95) is one of my favourites, the Spiral Chrome Plated Rack (£3.95) is modern with an interesting design and, if you want to splash out, the Chrome Rack with Glass Bass (£10.99) is a solid statement. Of the wooden pieces, the White Wood Silver Heart Holder (£8.99) is a cute design that would look great on any dressing table, and the Shabby Chic Holder (£10.95) has a really 'hand-finished' feel to it. While it may need a lick of paint over the writing, the Vintage Style White Letter Rack (£12.89) has plenty of palette room, and the French Chocolat au Lait Rack (£11.99) would make a definite focal point. 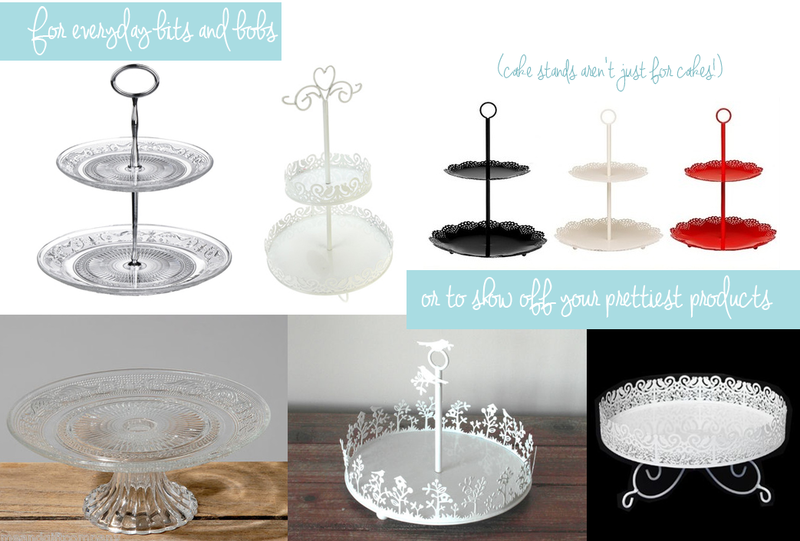 Cake stands don't only have to be used for cakes, and theres something about them that just makes me want to cover them in beautiful cosmetics. Available in two or three tiers, the Clear Glass Cake Stand (£9.75) definitely stands out to me for the interesting design cut into it, while the Two Tier White Metal Stand (£13.99) is surely too pretty and girly not to be displayed on the dressing table. The Funky Two Tier Metallic Cake Stands (£12.08) are handily available in three classic shades to suit any decor. 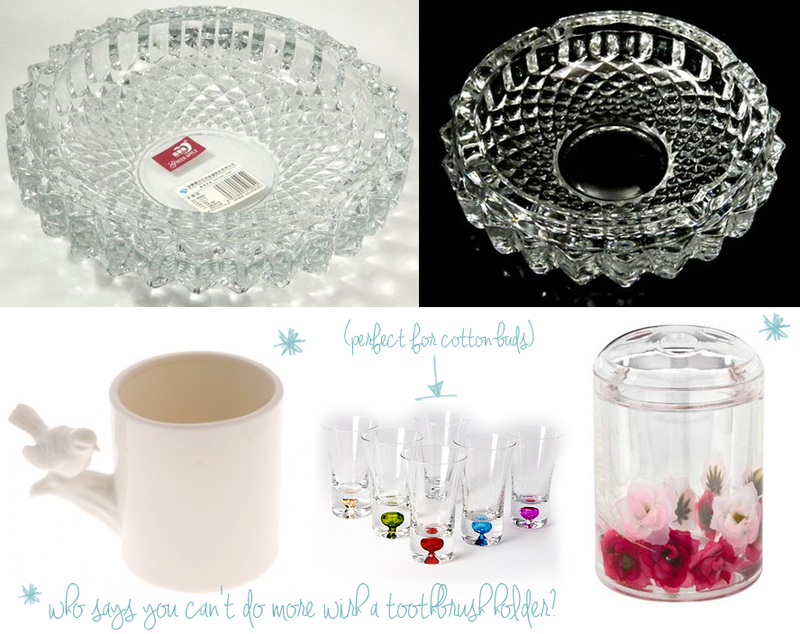 Forget the cake, the Vintage Style Clear Glass Pedestal (£6.99) would be perfect for storing everyday make up products, the Birds and Flowers Cake Stand (£6.95) was just too pretty not to be included in my picks, and the White Cup Cake Stand (£15.99) is pricey but so gorgeous to look at. As you can tell, I'm definitely one for repurposing storage products, and I use a something similar to the gorgeous Crystal Cut Big Glass Ashtray (£12.95) above to store lip balms and salves. The second Crystal Cut Ashtray (£7.95) is slightly smaller so would make a great display bowl for any cosmetics with a compact design. The Vintage Style Tooth Brush Holder Cup (£4.25) would be brilliant for storing eyeshadow brushes or eyeliner pencils with its cute little bird, and I use a similar design to the Toothbrush Holder with Vintage Inspired Flowers (£4.99) above right, for displaying my eye brushes, but with daisies instead of roses. I like to use shot glasses to keep cotton buds (Q tips) in easy reach when doing my make up, and the Set of 6 Colourful Shot Glasses (£8.29) would really brighten up any storage collection. Finally, if you enjoy a good DIY storage project, take a look at my Vinyl Record Storage Bowl post to find out how to repurpose your old records into cool and practical bowls. 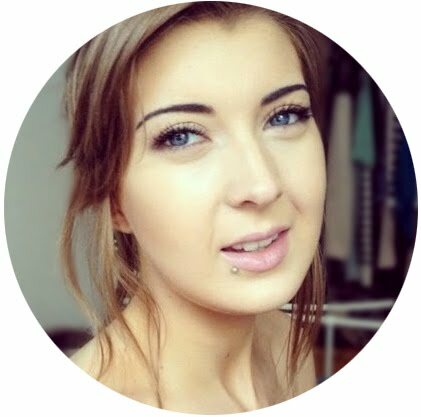 I'd love to know what you think of my picks, and what you're looking to update in your make up storage. I've added all the items to my eBay Watch List, and will be making a few purchases! Great ideas! This post was really useful, thank you. Haha, this list is so creative! I first looked at and thought, aren't those racks for toast and cakes?? :) Very clever. This is all soooo sooo cute! Dear gorgeous ladies, please spare just 5 minutes to fill out this survey for my Master thesis. Your input is invaluable and greatly appreciated! Many thanks for your time! Love this post Kirsty, it's given me so many great ideas :) I really want a pretty cake stand to store some beauty bits on!